This covers the tools you need to perform all hand tool operations, and the general information you need to know about them. Chris Schwarz's article Coarse, Medium, and Fine distinguishes between different bench planes as coarse, medium, and fine tools. As he mentions at the end, the concept is far broader than just planes; I think it's very fundamental to hand tool usage. All tools can be classified based on whether they perform coarse, medium, or fine operations (sometimes more than one). The scale can also be extended to extra coarse and extra fine, even double extra. This helps answer the question of which tools you need. First you need to determine the operations you'll be performing. Then you need to use the appropriate tools in the proper order. There's a logical progression of operations, using a logical progression of tools. Doing things out of order, trying to use a fine tool to do a coarse job, or trying to skip steps in the progression, just leads to wasted time and frustration. You start with the coarse tools to do the heavy work and make fast progress, leaving a rough result. Then you move to the medium and fine tools to refine that result. They'll cut more slowly, in smaller amounts, but leave cleaner, more accurate results (these tend to be the most time-consuming parts of any project; the devil is in the details). It's like traveling across country to visit Grandma. You fly in an airplane to cover most of the distance, drive in a car the last 10 miles from the airport, then walk the last 30 feet from the street to her front door, coarse, medium, and fine stages, all in a matter of hours. You could have walked the whole way, but that could take weeks! And you wouldn't stop with the coarse step, because Grandma doesn't live at the airport. Learning the proper order of operations and the appropriate tool for each step is one of the keys to success with hand tools (the other is that they must be SHARP!). This includes knowing which stage to start with (maybe there's no coarse work to be done; if you live in the same city as Grandma, there's no need for a plane ride) and which to end with (maybe you don't need to go all the way to fine; if you drive into Grandma's attached garage, you're already in the house). Don't bother with unnecessary coarse steps, and stop when it's good enough. Just as that trip mixed several modes of transportation, a sequence of operations often mixes different types of tools. No tool stands alone; they work together as a coordinated set to get the job done. For example, to prepare a stack of lumber for cabinet parts, you use large crosscut and rip saws to break them down to manageable size quickly, then use hand planes to refine the cut edges, reduce the thickness, and refine the faces, and use smaller saws to cut to final size. Similarly, borrowing Chris' final example, to make curved pieces, you use a bowsaw to cut out the rough curves, a rasp to refine them, and a spokeshave to finish them. As I go through tools and skills, I'll classify them as coarse, medium, or fine. 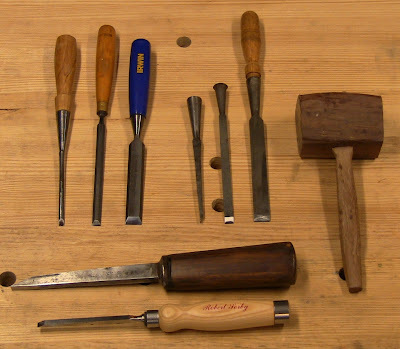 A number of questions arise when acquiring hand tools. What makes a good tool? Where should you buy them? How much should you spend? Should you buy old ones or new ones? What brands should you buy? There are three factors that make a good tool: good design, good materials, and good workmanship. A poor grade in any of these can ruin an otherwise good tool. This applies equally to old and new tools. The first skill you need to develop is the ability to evaluate tools, but it takes some time. Design details can be subtle; materials, especially metallurgy, can be complex; details of workmanship, good and bad, can be hard to see. Online forums can be a big help for information and reviews, though you'll have to sort out conflicting opinions. Where Should You Buy Them? New Or Used? You can get new tools from woodworking retailers or directly from the manufacturers. 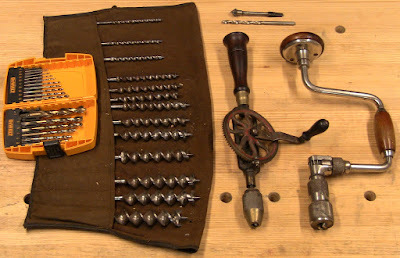 You can get used or old tools from flea markets, antique stores, online dealers, and auctions (both live and online). Similar to coarse, medium, and fine, we can classify tools as cheap (in price or quality), medium, and premium. The price range across this scale can vary by a factor of 5x to 20x. The quality can also vary by as much. For the most part when buying new, you do get what you pay for. It's worth paying extra for higher quality when you can afford it. An oft-quoted maxim on the woodworking forums is, "He who buys cheap buys twice." Used tools are more variable in price, but are often a good alternative to new ones. Good quality new tools are expensive. Good quality old tools are usually a tenth to a quarter of the cost (as long as you avoid the collectible ones), but you'll have to spend some time restoring them. I find it very satisfying to use a tool that may be a century or more old. Who was President when this tool was made? Sheer romanticism, but the historical connection adds to the experience. Good hand tools have lifetimes measured in decades. When you buy a good tool, you're making at least a 20- or 30-year buy. In most cases, they can be passed on to your great-grandchildren. 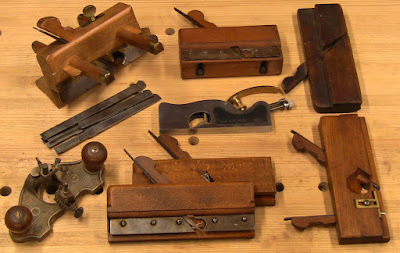 My hand tools are a random mix of new and used modern tools, antiques from the last 150 years, and a few new premium pieces; they range from lucky flea market finds to careful purchases from dealers and retailers. There are only a few companies currently making new hand tools. They range from one-man garage operations to large corporations with established brands that have existed for 150 years or more. 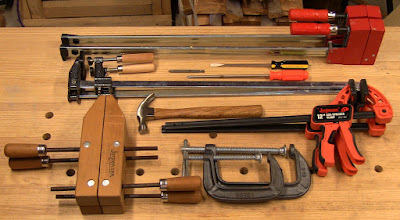 Many participants on the hand tool forums avoid the cheap tools at big-box discount stores and home centers on the grounds that they're the result of a race to the bottom to achieve low prices for consumers who don't know any better (with attendant social consequences; for a particularly egregious example, see this thread on the UKWorkshop Hand Tools forum). Poor design and ergonomics, such as saw handles, which used to be a high art when people used them for hours at a time. Poor metallurgy, especially in blades, which affects sharpness and edge life. A general degradation in the quality and quantity of materials: cheap metals, in weak thicknesses. Poor manufacturing techniques, such as poor castings and replacing machined parts with cheap stampings. Poor quality consistency, primarily in planes, which require a combination of casting, machining, fitting, and assembly. They also treat the current products from the large established brands with disdain, feeling that the corporate drive for higher profits and lower costs has driven the quality down. They generally prefer the products those companies made prior to World War II. However good those brands may have been in the past, the feeling is they've lost their edge. 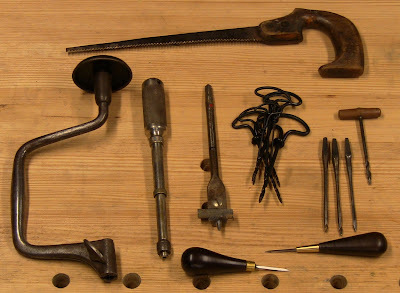 Pre-war, hand tools were a volume market, so justified the investment in tooling and manufacturing skills. Post-war, with the widespread adoption of power tools, they're a niche market. I don't have enough experience or technical knowledge to say whether that's entirely justified in all cases, and I don't want to condemn products without knowing what I'm talking about, but it's a simple economic reality that a large company relying on volume sales isn't going to invest a lot in a product line that only accounts for a tiny fraction of its overall profits. Markets change and companies have to change with them; once-strong product lines get marginalized; brands get sold off to other companies who may or may not be interested in maintaining the quality behind the name. In contrast, a small company like Lie-Nielsen that relies on one product line for all its profits is going to put everything it has into those products. The results can far outshine the large competitors despite limited resources. Their customer service is often as excellent as their products. They do tend to be more expensive due to the low volume, otherwise they wouldn't be able to stay in business. I do have enough experience to say that just about any tool can be made to work as long as it's not complete junk. The difference is that you'll have to spend more time getting it working satisfactorily, and it'll require more frequent sharpening and adjusting (maybe to the point that's its just not worthwhile). So it's not hopeless if you can't afford the best tools, but you'll pay the price in time and frustration. This page by Bob Kaune has some comments about old vs. new from an experienced dealer. Cheap Tools: Just Say No! Here are a couple of examples of what you should avoid. Neither one has a brand of any kind on it, so the makers apparently preferred to remain anonymous rather than be associated with them! A cheap saw and a cheap plane. First is a cheap handsaw I bought about 5 years ago before I started looking for antique saws. The metal in this may be ok, but the teeth are just stamped out, not sharpened. The handle is just ugly, and lacks the fine shaping that made older saws easier to use. The stamped teeth of the saw. Saw teeth should be filed. Second is a no-name knockoff of a Bailey #5 that I bought 20 years ago when I was young and foolish. I never could get it to do anything useful, and very nearly heaved it against the concrete floor in anger. Now that I'm old and foolish, but I know how to sharpen an iron and handle a plane, I've gotten it work (just barely!). But it's not worth the trouble. It's sole is slightly bellied as I run a machinist's square down it, the iron is a laughable stamping of sheet steel, the lever cap seems like it would crack under any real force, and the frog is such a light casting that at first I thought it was plastic. The plane parts are all cheap and light. My trusty Starrett machinist's square reveals the bellying in the sole. For a couple of additional perspectives, here's an article by Scott Spencer that echoes my experience with cheap planes. It also talks about the variability in different products lines from the same manufacturers. And here's a video of Garrett Hack talking about cheap chisels. Ok, after all that, there is one good use for cheap tools, and that's sharpening practice. Rather than learning how to sharpen using expensive new high-quality tools, you can buy cheap home-center plane irons, chisels, and saws. That will allow you to learn the mechanics of sharpening without risking the good stuff. Prices for old tools range all over the place, sometimes driven by collectibility rather than usability, but you can usually find affordable choices. The condition can also vary widely, from tools carefully protected in a workshop to those left out behind the barn. But many ugly rusted hulks can be rehabilitated into useful tools. If you have the time to do that, it can be quite rewarding. Some dealers specialize in well-preserved tools, though that will be reflected in the price. Buying from other sellers can be hit or miss, whether online or at flea markets and antique shops. Some are very good, particularly if they specialize in old tools and have reasonable return policies. The riskiest ones are those that only have a few tools among other antiques. They often don't realize when tools are damaged, are missing parts, or have mixed parts that don't work together. You need to inspect the tools carefully. When buying online, compare to photos of known examples when you can. 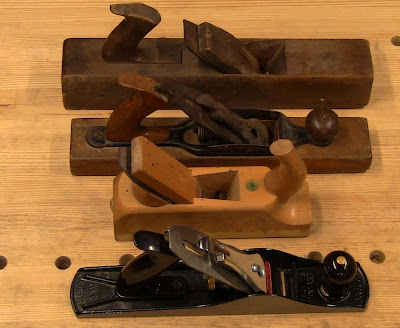 A frequent complaint when buying handplanes is that the body of the plane is one brand, and the iron or lever cap is another size or brand that doesn't fit properly. I've made that mistake. Sometimes you have to cobble together a working tool from different purchases, so it's good to have a few backup parts. I always get a chuckle when a seller recommends a tool because it's sharp. That's like recommending one used car over another because its gas tank is full. Neither is a measure of actual quality. I can easily sharpen a good tool that happens to be dull, just as I can easily fill an empty tank. Which Old Tools Are Good? A lot of information about old tool brands, their potential problems, and how to restore them can be found in the historical information listed on the links page. There are also a number of posts on identifying, dating, and restoring old tools listed in the Sawmill Creek Neanderthal Wisdom/FAQs (in addition to a wondrous array of other highly educational posts). Some brands, such as Stanley, have been heavily researched and documented online. Below are some of the old brands that are worth looking for, with some of their primary tools. I own at least one item from all of these except Record (though my premium Lie-Nielsen shoulder plane is based on an old Record design). A somewhat arbitrary guide to age is the handle: if it has a plastic handle, it's not one of the good old tools. This page by Bob Kaune lists Stanley trademarks by year; he also has a type study of Bedrock planes here. This set of pages by Joshua Clark provides additional resources on Stanley dating, including a type study. There were also innumerable small wooden planemakers. Most basic wooden planes are inexpensive. If they aren't seriously cracked or warped and the irons are in good shape, they can usually be cleaned up and put to use. Fancier ones start to be more expensive. Wooden plow planes originally came with sets of irons in different cutting widths, but most old ones are sold with only a single iron, the rest having gone missing in the mists of time. Good dealers will have sets of irons for sale, but you have to be careful about matching them to the width of the plane mouth. There are two attitudes towards premium tools that are worth considering. The first is that your time is valuable, so why waste it trying to get questionable tools into shape? Invest in premium tools and you can start using them immediately. Building stuff is the name of the game, not tweaking the tools. However, this can be prohibitively expensive. It's also worthwhile to know how to restore tools. Time spent fiddling with old tools can be considered an investment in learning how to maintain them. The second is somewhat more modest, and I think quite practical: buy at least one really top notch tool of each type so you have something to use as a benchmark. If all your tools are old rusty beaters or only moderate grade new ones, how do you know if they're in top shape? If you don't have any experience with better ones, you may be making your work more difficult than it needs to be. 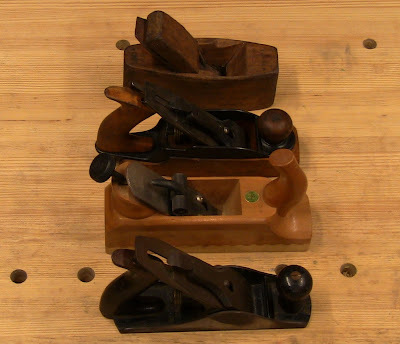 When I started using hand planes, I struggled for quite a while, the sweat pouring off tackling the simplest tasks, because I thought I had done a good enough job preparing the tools, but I hadn't. Only by luck did I realize I had to go further, and eventually the work got much easier. Had I invested in one Lie-Nielsen premium plane, I would have realized the others weren't performing nearly as well. Based on the all the above, the best choices for a beginner are old tools from brands with good reputations, and new tools from small specialty companies. I've listed some well-respected old tool dealers and new tool companies on the links page. Expect to spend anywhere from a week to a year acquiring your tools, depending on where you get them. It's all a matter of how you want to spend your time and money. If any of the #4, 5, or 6 Stanley equivalents in the line cost less than $50, avoid them! For planes in the $50-100 range, look them over carefully. They're the bottom end of the usable range, but can be made to work. Better are planes in the $100 and up range. They'll have the best chance of working well without tuning, though may need sharpening. Note that some edge tools are deliberately sold rough-ground only, leaving it up to the purchaser to sharpen it to his preferences. Another option is to buy third-party replacement irons, such as Hock, Pinnacle/IBC, and Ray Iles. These cost $30-60, and can help upgrade a moderate plane to the next level (though the plane body itself may still need work). This is also a viable option for old planes. If you order all your tools from Lie-Nielsen, Lee Valley, Tools For Working Wood, and other high quality websites, you'll have the best of the best in a matter of days, at the greatest cost, and be done with it; they'll be ready to use out of the box. This would cost roughly $2000 for the minimum recommended set (listed below). For more moderate cost, you can get different brands of new ones piecemeal from various retailers, though the quality will be variable and may require some tuning time. This would cost about $500 to $1000. Buying from well-known used tool dealers will take a few months, depending on what they have available, and will probably require some tuning time. This would cost $400 to $800 (though a few high-priced prizes could drive that up several hundred). The cheapest but most time-consuming alternative is to scour flea markets, antique shops, and online auctions. Expect to spend some time refurbishing them; you'll also wind up with a few real dogs. This process can be a lot of fun, though. The joy of finding a new treasure, dating it via online references, and the satisfaction of restoring it to use, can be as rewarding as using it. Just be warned that it's addictive! This would cost $200 to $400. In addition, you'll need to invest between $50 and $300 in a sharpening setup (see retailer links). Otherwise all your investment in tools will be worthless in short order, no matter where they came from. As you look at edge tools, you'll see references to the steel used in the blades. This can be a bit mystifying for the non-metallurgist. For a quick introduction to tool steels, see this article by Stu Tierney. For much more detail without getting too technical, get a copy of The Perfect Edge by Ron Hock. For technical detail, you can start with this Wikipedia entry and follow the links for days. Here's a quick summary. Steel is formed from iron and a specific range of carbon content. Iron with carbon content below that range is known as wrought iron, which is ductile (flexible), too soft for blades. Iron with carbon content above that range is cast iron, too brittle for blades. So the range of materials from low to high carbon content is wrought iron, steel, and cast iron. The actual percentages by weight of carbon are quite low, from a few hundredths of a percent to a few percent. Within the range of tool steels, there are low-carbon and high-carbon steels. The simplest steels are just iron and carbon (and any impurities that haven't been removed in the manufacturing process). More complex alloys are formed by adding various elements, chromium, manganese, molybdenum, nickel, tungsten, and vanadium, to control the characteristics of hardness, toughness, and corrosion resistance. Heat treating is the process of heating the metal to high temperature to change its physical crystalline structure to make it harder; different crystal structures of the same material have different strength properties. Each alloy has a specific set of temperatures where changes in the structure occur. Each uses a particular method for quenching (cooling) to control those changes. The different quenchants determine the speed of cooling, balancing the need to lock in a crystal structure quickly without cracking the metal. Once hardened, the steel is brittle, so it's tempered (reheated to relatively low temperature) or laminated with softer iron to reduce that brittleness. It's all a balancing act to get a blade that will sharpen to a hard edge, that can then stand up to use. W1 - High-carbon, plain-carbon steel, just iron and carbon. O1 - In addition to a different carbon content, adds chromium, manganese, and tungsten to increase hardenability (with corresponding reduction in weldability). A2 - Again, different carbon content, with chromium and molybdenum, for even more hardenability. Water is the fastest quenchant, the familiar image of the blacksmith plunging the red-hot metal into a bucket that bursts with steam. Oil is slower (and flammable!). Air is the slowest, with the steel literally left to cool in still or forced air after removal from the heat. Too-fast a quench for a steel that requires slower cooling can crack it. After quenching, the steel is very hard and very brittle, around Rockwell Rc66. It's tempered by reheating to a few hundred degrees (depending on alloy) to reduce these properties to a usable level; for example, Lie-Nielsen says its plane irons are Rc60-62. The higher the temper heat, the softer it gets. This is the reason you have to be careful when sharpening too fast on a grinder; the friction can heat the metal past its previous tempering point, re-tempering it at a higher temperature, thus softening it. Then it either has to be ground back to unaffected metal, or completely re-hardened and re-tempered. So be patient, and be cool. High-carbon steel (W1) is what you find in old tool blades, typically laminated to wrought iron. This improves the overall durability of the blade, balancing the brittleness of the steel (remember, it's high carbon, getting near cast iron, and it may not be tempered) with the ductility of the wrought iron. These are also known as laid steel or cast steel blades. When you sharpen the edge of a laminated blade, you can see the two different layers. The advantage of O1 and A2 steel is that these harder alloys produce a more durable, wear-resistant edge, requiring less frequent sharpening. The downside to that is they are more difficult to sharpen, particularly A2. A2 also has larger carbide grains throughout the matrix. Carbides are formed as the carbon combines with the iron and other alloying elements. They're extremely hard (ever hear of carbide-tipped bits? ), so the final edge obtained is limited by the size of the carbide grains. Since the grains formed by the other elements in A2 are larger than the ones formed in W1 and O1, it can't achieve quite as sharp an edge as they can. The larger grains are also more susceptible to chipping out (at a microscopic scale). Again, it's all a balancing act. What properties are you willing to sacrifice in favor of others? Blades may also be cryogenically treated to increase hardness and durability. Due to these considerations, some woodworkers will swear by one steel or another. Opinions can get quite heated (probably hot enough to ruin the temper of a high-carbon blade!). The other steels you may see are 1095 and HSS (High-Speed Steel). 1095 is a high-carbon steel; according to "Steel Metallurgy For The Non-Metallurgist" by John D. Verhoeven, it's essentially the same composition as W1. HSS in M (molybdenum) and T (tungsten) grades retains its hardness at high temperature, so it's used in applications that generate a lot of friction in high-speed cutting, such as drill and machine tool bits. That isn't a concern for hand tools. Hand tools need to be SHARP. Not sort of sharp. SHARP! That makes for efficient work. That also makes for risk of injury from the sharp edges, points, and teeth. Using dull tools is just frustrating and time consuming. It's also dangerous, because you start trying to force them. Then they jump and skitter on the work rather than cutting properly. You need to pay attention to those sharp edges and points. While hand tools pose less risk of some types of injury than power tools (there's little risk of amputating a hand), they can still cause serious stabbing and slicing injuries. A chisel or saw used carelessly can cut through soft tissue, connective tissue, blood vessels, nerves, and bone. Simple cuts can heal quickly, but nerve damage or severed tendons can take much longer or be permanent, requiring months of rehabilitation. In some cases, such injuries can be life-affecting; imagine losing the use of your hand because you sank a razor-sharp chisel deep into your palm. That should give you the willies. Keep a simple first-aid kit in the shop with antiseptic wipes, bandaids, gauze pads, a roll of gauze, and fine-pointed tweezers. Even if you avoid serious injuries, there'll be the inevitable little nicks and cuts, and plenty of splinters to pull out. The gauze is there for quick aborbency with a more serious injury, where'll you'll need to apply direct pressure or wrap it to control the bleeding. Never allow any part of your body to be in the path of a chisel. That means your other hand holding the work, your leg, your torso. Direct the chisel away from you and keep everything behind the edge. Keep your fingers away from the sharp edge and corners when handling them. If a chisel rolls off the bench, DO NOT try to catch it! Jump back and let it fall; you can resharpen it afterwards. That's a reason for octagonal handles. The same applies to gouges and carving knives. Two-handed planing is pretty safe because both hands are on the tool. Most injuries are the result of one-handed planing, either using a small plane such as a block plane, or holding a small piece of wood and running it over a large plane. Watch your free hand to make sure you don't run the plane over your fingertips or knuckles. For small pieces, try to hold them in a clamp or some kind jig rather than free hand, which is liable to result in running your fingertips over the edge. The main risk from saws is running the teeth over your hand or fingers. This can happen when starting a cut if the saw jumps, during a cut if you aren't paying attention to the progress of the saw, or when finishing a cut and the saw drops through. When using a marking knife while holding a ruler or square, keep your fingers well clear. It's easy to run the knife over a fingertip when marking out a line. When using a drill or auger, pay attention to where the tip will come out. Keep your fingers clear of lead screws and sharp flukes. When sharpening, be careful about loose blades slipping in your hands, especially if your setup uses water or honing oil. DO NOT run you finger sideways along an edge to check it! If you run your finger over an edge to check it, do it slowly with a light touch; nicks and wire edge can still slice. Keep your fingers and knuckles clear of abrasive surfaces, particularly grinding wheels. Also keep loose hair and clothing clear of grinding wheels. Any woodworking risks injuries from clamps and joints closing up, as well as handling heavy workpieces and dropping things on your feet. Working with mallets adds the risk of hitting your hands while holding a chisel; make sure you hold it low enough on the handle so you don't smash the web of your hand with the mallet. Is you tetanus shot up to date? Life is full of risk. The key to safety is to identify and understand the risks and take action to mitigate them. I used to be a Boy Scout Scoutmaster; part of my responsibility was to teach my Scouts good judgement in handling fire, knives, axes, bows and arrows, rifles, and shotguns, while participating in outdoor activities like backpacking, climbing, water activities, and shooting sports. There were all kinds of ways to get hurt, so safety was a top priority. The advice I constantly gave them applies here: ask yourself before you do something, is this a good idea or a bad idea? Stop and think it through, including the consequences of a mistake or having the wood break apart unexpectedly under your tool. Is the work held properly? Is the proper tool being used in the proper way? Is the tool properly tuned and setup? Will the tool follow a safe path? Is it liable to come through the wood? Are you out of its way? Are others in the room out of the way? How much force will you be applying? What is the chance of a slip? When it's a bad idea, and you know it's a bad idea, don't do it; make it right first. The tools you need are defined by the operations you want to perform. 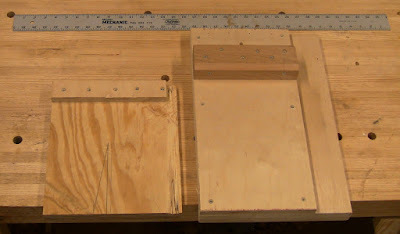 Every woodworker has their own idea of what constitutes the minimum set, and in what sizes. One person's can't-live-without-it tool is another's useless gimmick. My criterion is the set of tools that allows you to do all of the common woodworking operations at minimum cost. Additional tools then offer more flexibility and choice. In particular, chisels are extremely versatile once you develop the skills, but there are a number of specialty tools that work in their place for specific operations. Everything shown here works and works well at its designated task. Some of the items are premium quality, some are not, but they all get the job done. An upgrade here or there might help the job along. Sharpening. Extra coarse to extra fine steps, depending on the condition of the edge or teeth. Breaking down boards into manageable pieces. A coarse operation. Stock preparation (i.e. finishing pieces to size: length, width, and thickness). Coarse, medium, and fine steps. Cutting and fitting joinery. Medium and fine steps. Making holes of various sizes. A fine operation. Final trimming and cleanup. Primarily a fine operation. Working curved pieces. Coarse, medium, and fine steps. Throughout, you'll be doing various measuring and marking. Even this can be done at coarse, medium, and fine levels: for rough cutting, you may only measure to the nearest 1/8" or larger, while for fine joint cutting, you'll measure as precisely as you can. Except for breaking down boards, done on sawbenches and sawhorses, all operations need some kind of workbench with work-holding devices. Below is a list of the minimum tools required for each of these operations. The actual use of each tool will be covered in subsequent chapters. The names of old tools were somewhat variable, depending on the different woodworking trades, geography, and the period. The same tool may go by different names, and sometimes the same name means different things. I've tried to use a reasonable set of names, but a little confusion seems inevitable, so I'll just apologize in advance! Saw length refers the length of the plate from toe to heel, i.e. the length of the toothed section; handles add another 3-5". PPI is points per inch, i.e. the number of tooth points in an inch when setting the ruler starting mark on the first point. The saws you find may vary a bit from the recommended sizes and PPI. Recommended chisels reflect typical stock sizes. You may work with different stock that requires different sizes. Sharpening is messy, producing dry, oily, or watery swarf. Waterstones are the messiest, since they have to be soaked, and the stones themselves wear away as part of the sharpening process, adding to the mess. Wet systems need paper towels or clean rags. You can get started with sandpaper sharpening for under $30 for an initial selection of papers and spray adhesive, but costs start to add up as you consume them; a longer term set of rolls and papers as shown below cost about $120. A set of oilstones cost $130 to $140, depending on use of combination stones; an Arkansas stone is most of the cost. A set of waterstones though 8000 grit cost $120 to $200. A pair of combination diamond stones cost $140 to $210, depending on size. Of the stones, waterstones wear the fastest. Whichever system you choose, use extra coarse sandpaper or a grinding wheel (hand-cranked or powered) for doing heavy coarse grinding, such as grinding back a chipped or cracked chisel or completely reshaping a bevel. Doing this on your other abrasives would wear them down prematurely; save them for refining and maintaining the edge once the heavy work has been done. 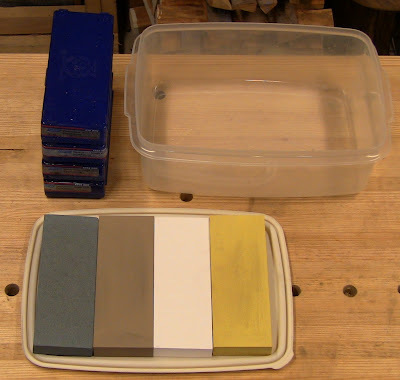 Sandpaper sharpening: rolls of Klingspor PSA (Pressure Sensitive Adhesive) paper in 80, 120, and 320 grits, and sheets of Klingspor wet-dry automotive paper in 600, 1000, and 1500 grits. The glass with the first three grits adhered is tempered glass shelving, available in the home center shelving section. Upper middle: granite reference plate with 80-grit for heavy coarse grinding. 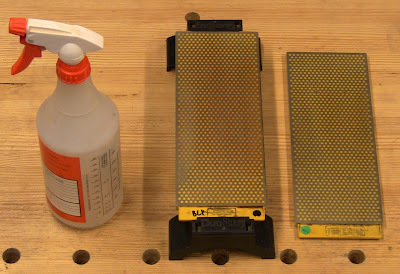 Upper right: solvent and single-edge razor for removing the paper and adhesive; it can be a nuisance. 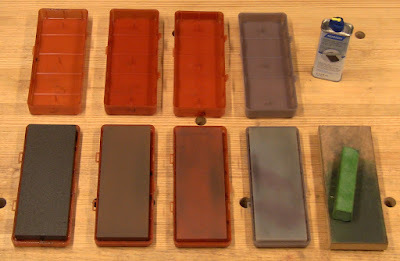 Oilstone sharpening: Norton India stones in coarse, medium, and fine grits, Norton hard translucent Arkansas stone, and leather-covered MDF strop with green rouge stick. Norton honing oil upper right. Waterstone sharpening: Norton waterstones in 220, 1000, 4000, and 8000 grits, with soaking tub. Diamond stone sharpening: water sprayer (also needed for waterstones), DMT Duo-Sharp diamond stones in extra-coarse/coarse and fine/extra-fine grits, plus stone holder. General (Milwaukee, WI) hand-cranked grinder with Norton coarse white wheel and dressing stick, Veritas and Eclipse jigs with Veritas and shop-made setting guides. Shop-made saw/scraper vises, triangular files, flat file, Hock burnisher rod in unnecessarily heavy handle, Stanley #42x saw set. Large crosscut saw, 8 PPI, 26-28"
Large rip saw, 6 PPI, 26-28"
Disston crosscut and Preston rip saws. Upper left: beeswax block for lubricating saws and planes (note wax scribbles on saws). Saw PPI is stamped on heel just below handle. 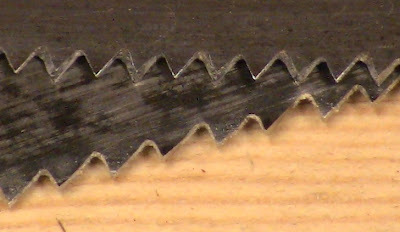 Closeup showing crosscut (top) vs. rip tooth filing pattern. Both patterns have teeth set to alternating sides, making the kerf wider than the sawplate to clear sawdust and prevent binding. Crosscut teeth are filed like knife points on inner faces of teeth, to slice across fibers. Rip teeth are filed straight across like chisels, to chisel out along fibers. Benches and horses, all shop-built. 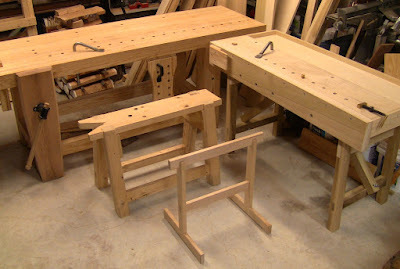 Left: large stationary Chris Schwarz Roubo-style workbench with leg vise, sliding deadman, and holdfasts. 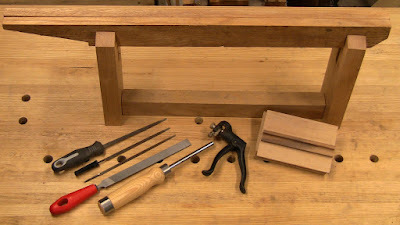 Right: small Roy Underhill portable workbench with Gramercy Tools holdfast and Veritas Wonder Dog. Roy Underhill likes bench height to be where pinky joins hand; Mike Dunbar likes it to be where palm rests flat on top, about 2" higher. Center: Chris Schwarz sawbench, knee-high, and James Krenov trestle-style sawhorse, top even with sawbench. Better sawhorse: top edge even with workbench, lower rail even with sawbench. 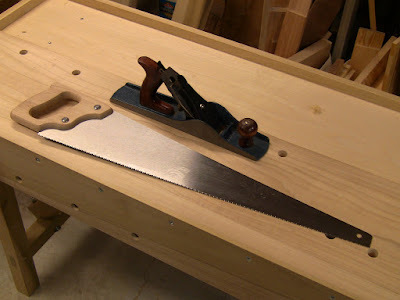 This article by Leif Hanson provides some additional information about different types of handsaws. Medium crosscut backsaw, known as a tenon saw, 13 PPI, 12-14"
The three planes above (listed by their Stanley numbers) are known as bench planes, because you use them so much they're always on your bench. They're used in coarse, medium, and fine order: first the medium-length jack to do rough stock removal, then the long jointer for flattening, then the short smoother for final surfacing (edge work usually stops with the jointer). 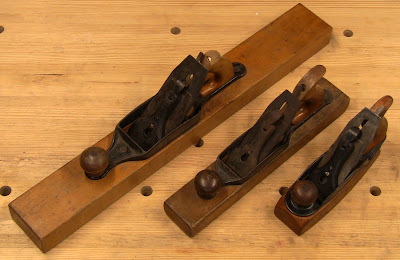 Strictly speaking, the Stanley #6 was considered a fore plane, essentially a long jack plane, but I like to think of it as a short jointer, lighter and easier to handle than the #7. On the other hand, the longer the better when flattening large pieces, to get an accurate, flat surface. 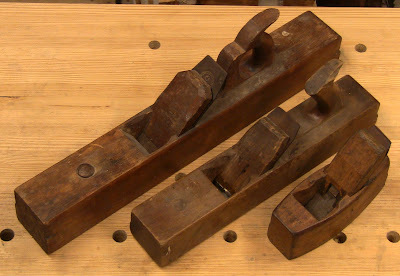 Bench planes may be metal, wooden, transitional (wooden soles with metal frogs and adjusters), or modern wooden. You can also mix and match to get a set of jack, jointer, and smoother. Each type handles a little differently due to different geometry (affecting balance and direction of force application), size, materials (affecting friction on the work), and weight, so each one is a new learning experience. If you have a choice of sizes, try to match the plane to your body size and strength. Smaller people can opt for the smaller planes (#3 and #6, shorter wooden jointers), larger people can opt for the larger ones (#4 and #7, longer wooden jointers). Long metal planes are heavy, so a too-large plane can be tiring work. Long wooden planes, while not as heavy, can be awkward to handle. There are also even smaller #1 and #2 smoothers, and a larger #8 jointer. However, these were all less popular sizes, so it's harder to find old ones, and they can be very expensive; the #8 is also pretty heavy. 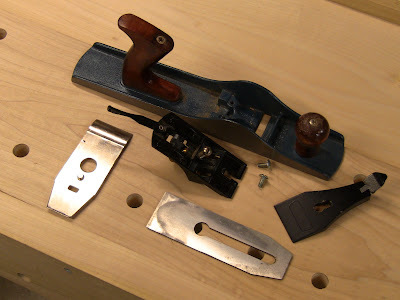 The jack plane is not a precision instrument, so even a fairly cheap or beat up one will suffice; the only thing that should take any time to tune is cambering the iron. Save your money for the best jointer and smoother you can afford. Note that all the bench planes shown below are bevel-down style. There are also low-angle bevel-up bench planes. I don't have any experience with them, but some people swear by them. 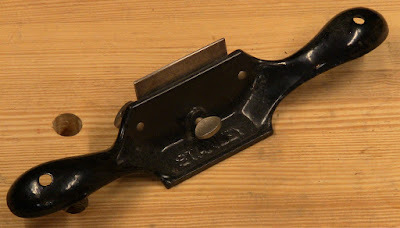 Stanley metal planes, #4 smoother (pat. 1910, 9 1/2"), #5 jack (new 2005, 14"), #6 jointer (pat. 1910, 18"). This is size order, not the order you use them, an endless source of confusion for beginners. 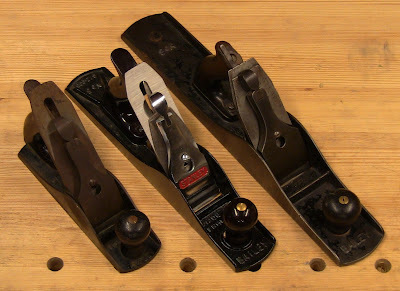 Stanley irons in usage order, showing cutting edge shape: #5 jack iron cambered to ridiculously-aggressive 4" radius for rough work (8" is much more reasonable), #6 jointer iron cambered just a hair, and #4 smoother iron straight across (should have corners knocked down to eliminate plane tracks in wood). Wooden jointer (22", a short one), jack (Miller #12, 16"), and coffin smoother (Osborn and Co., 7 1/2", named for its shape, not its use). Stanley transitional #32 jointer (26"), #26 jack (15"), and #35 Bailey smoother (9 1/2"), all probably c. 1920's. ECE wooden jointer (25"), jack (9 1/2"), and Secundus Expert smoother (9 1/2"), all probably c. 1980's. ...and one from column C (smoother). 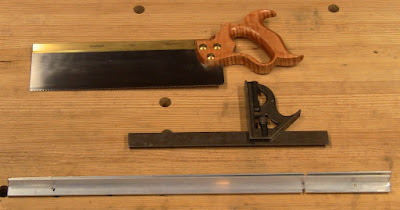 Lie-Nielsen 12" tenon saw, Starrett combination square, and aluminum angle-iron winding sticks. Long straightedge, and shop-made bench hook and shooting board. Bench hook has 6:1 dovetail slope marked on it for setting bevel gauge. Shooting board face allows shimming for exact 90 degree setting. Both hook over front edge of bench. Small rip backsaw, known as a dovetail saw, 15 PPI, 9"
Bench chisels (square or bevel-edge), 3/8", 3/4"
Firmer chisels, i.e. heavier for striking with mallet, 1/4", 3/8", 3/4"
Chisels used to be available in a bewildering array, in all sizes from light pattern-maker's paring chisels to large framing slicks. Many trades had their own particular versions for the specific scale and type of work they did, using particular types of wood. So "mortise chisel" is actually a pretty generic term. Mortise for what kind of work? Cabinetmaking, sashmaking, doormaking, timber framing, hinge installation, etc.? In terms of coarse, medium, and fine, firmer chisels are meant for heavier work, using a mallet, and are typically straight-sided, but can also be bevel-edged. Bench chisels are a medium weight for paring and light mallet work (heavy mallet use risks damaging them). They're usually bevel-edged. Paring chisels are very light and thin, somewhat flexible, bevel-edged and should never be struck with a mallet, for fine paring (some were really only meant for pattern-making work in softwoods, i.e. the patterns used in sand molds for casting molten metal). Mortise chisels are the real brutes, because they're meant to take heavy pounding when chopping mortises deeply into the wood. However, there are different types of mortise chisels, sash mortise being the lightest for working on window sashes, and oval-bolstered mortise being the heaviest. 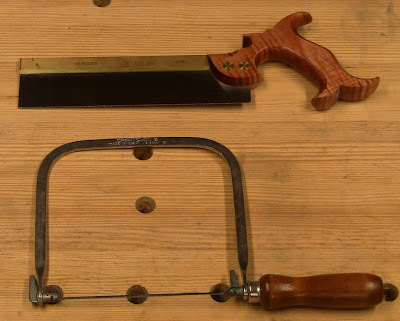 Lie-Nielsen dovetail saw, Craftsman coping saw. Clockwise from top left: 1/4" bevel-edge socket chisel; Marples 3/8" bevel-edge paring chisel (note light tang, not for use with mallet); Irwin "blue handle" 3/4" bevel-edge chisel; socket firmer chisels in 1/4", 3/8", and 3/4"; old shop-made mallet; Sorby 1/4" mortise chisel; Buck and Hickman 3/8" oval-bolstered mortise (OBM) chisel, affectionately known as a "pigsticker". Having sets of different sizes of each type is nice, but if your selection is limited, you can sometimes get away with using any chisels any way within reason. 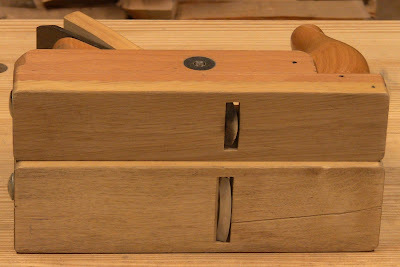 You need to pay attention to whether they were meant to be struck heavily with a mallet or only pushed by hand or light mallet taps, and be careful using non-mortise chisels for mortising, to avoid snapping them (this starts to fall under the safety rule of using the proper tool for the job). Those meant for use with a mallet will be heavier and may have hoops or leather at the top. Probably anything falling under the name mortise chisel can be used for mortising as long as its at roughly the same scale (i.e. using a sash mortise chisel for heavier mortising, but not as heavy as timber framing). So a completely random selection of chisels in various sizes is fine. The other important specialization is bevel-edge sides; these allow getting into tighter spaces like between dovetail pins. This thread by Bob Smalser and article by Bob Rozaieski provide additional information about different chisel types. 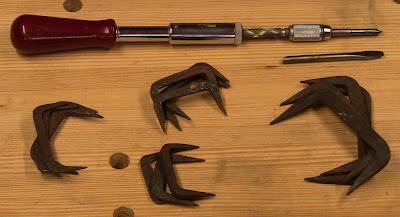 Modern Dewalt twist drill bits, Irwin auger bits, Millers Falls #2 eggbeater drill (c. 1920's), Worth 10"-sweep brace. Top right: countersink bit for brace and modern brad-point bit. Parrallel clamps, 2 @ 24-36"
Bar clamps, also known as F-clamps, 2 @ 24"
Quick release pistol-grip clamps, 2 @ 12-18"
Wooden handscrew clamps, 2 @ 10-12"
From top: Bessey K parallel clamps, 24" opening; flat and philips screwdrivers and philips power driver bit (fits brace); bar clamps, 24" opening; small hammer (this isn't heavy carpentry); Jorgensen quick clamps, 12" opening; Jorgensen #1 handscrew clamps, 10" length; Craftsman C-clamps 4" and 6". 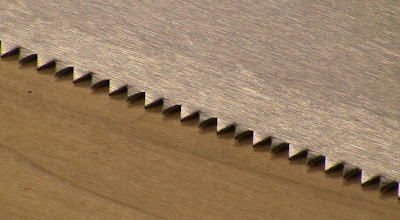 Top: Japanese flush cut saw. 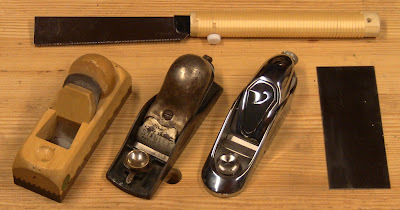 Bottom row, like the bench planes, several styles of block plane to choose from: ECE (c. 1980's, normal angle); Stanley #18 (pat. 1913, normal angle, adjustable mouth); Veritas NX60 (new, low-angle, adjustable mouth). The low-angle is better for working on problem grain or end grain. The adjustable mouth allows you to fine-tune the shaving size. You can use a block plane as a small smoother (similar in size to a Stanley #1 smoother). Bottom right: card scraper, just a rectangle of thin, flexible steel that takes an edge. Rulers, 6", 18", and 24"
Upper left: 24" wood/brass folding rule; 18" steel rule; 12" wood/brass folding rule; 6" steel rule. 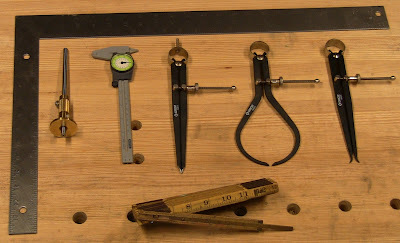 Across the bottom: Starrett 3" machinist's square; scratch awl; General protractor; Stanley bevel gauge (pat. 1914, in preferred style with locking screw at end, not at pivot); X-acto knife; compass; Rabone marking gauge with mortise marking points. These tools give you additional flexibility and help simplify some tasks. In particular, there are a number of types of specialty planes, as well as additional sizes of items. They can be acquired as needed. No doubt you'll find some things of your own to add. Medium crosscut saw, known as a panel saw, 10 PPI, 18-24"
Medium rip saw, also known as a panel saw, 8 PPI, 18-24"
Disston crosscut, Disston D-8 rip saws. Stanley #80 scraper (pat. 1914). 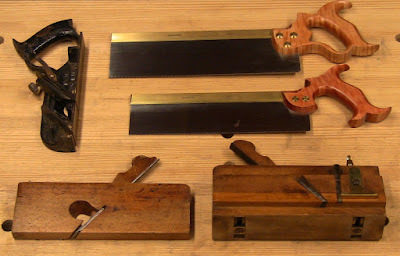 Medium rip backsaw, known as a tenon saw, 10 PPI, 12-14"
Small crosscut backsaw, known as a carcass saw, 14 PPI, 11"
Clockwise from top left: Stanley #78 duplex filletster and rabbet plane (c. 1909); Lie-Neilsen 12" rip tenon saw and crosscut carcass saw; CW Denison moving fillister plane; and Bodman and Hussey 3/4" skew rabbet plane. 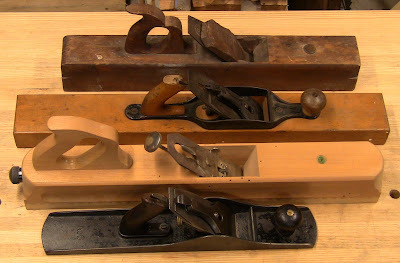 Clockwise from top left: Mathieson and Son wedge-arm plow plane with irons; John Hall 1/8" grooving plane, basically a dedicated plow plane that only does one width; #12 hollow molding plane, one of a set of hollows and rounds used for making custom molding profiles; Warren 11/16" dado plane (note the depth stop and the additional iron and wedge at the front, to score across the grain along the sides of the dado); matched pair of Charles Nurse 5/8" tongue-and-groove planes (i.e. 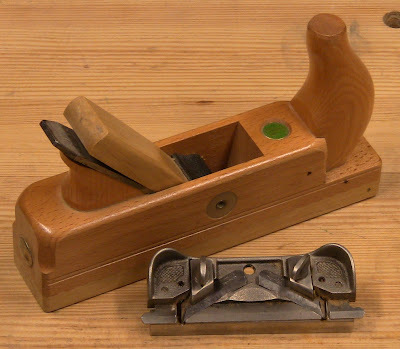 match planes, often found missing their mates); Stanley #71 router plane (pat. 1907). 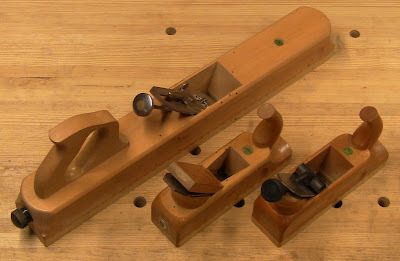 Center: Lie-Nielsen 3/4" shoulder plane. Lie-Nielsen dowel plate, Craftsman alignment pins, pair of Crown Tool skew chisels, Ashlely Iles swan-neck chisel. Clockwise from top left: Stanley #112 compass plane (pat. 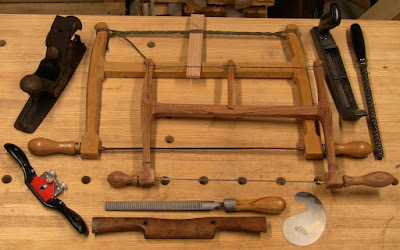 1879); Marples bow saw; shop-made bowsaw using Gramercy Tools hardware kit; Surform rasp plane and cylinder rasp; curved scraper; half-round/flat rasp; wooden flat spokeshave; Stanley convex spokeshave (c. 1980's). Top: keyhole saw. Middle: Fray and Pigg Spofford brace (pat. 1859, 8" sweep, my favorite brace because it's so light and simple to use, but it only works with square shank bits, unlike a regular brace that can also hold round and hex bits); North Bros. Yankee #41 push drill (pat. 1901); expansive bit; set of Lee-Valley gimlets; three old gimlet bits for brace; T-handle gimlet. 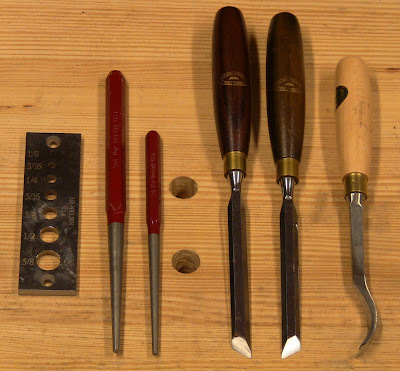 Bottom right: Crown Tool birdcage awl (left) and Veritas chisel-point brad awl. Pipe clamps, 2 ea. 36", 48"
Top: Stanley Yankee #30A push driver and bits. Bottom: assorted pinch dogs. Top: 24" framing square. Middle: Glen-Drake Tools Tite-Mark, a premium cutting wheel gauge; General plastic dial caliper; Groz dividers, outside calipers, and inside calipers. Bottom: Lufkin Extension Rule, 6' folding rule with brass extension for taking inside dimensions, such as diagonals of box or carcass to check for square. Here are a couple of items I missed above. Ulmia scrub plane (c. 1980's) and Stanley #79 side rabbett plane (c. 1950's). Comparing the scrub (top) with the jack. The scrub iron is cambered to about 2" radius, compared to the 8" radius for the jack, making it an extremely rough but extremely fast stock remover. It's narrower because you wouldn't be able to drive a wide iron cambered that tightly. What do you think the jack iron looked like after the sole got scored like that? It's like seeing skid marks on the road that end in a guard rail. Nice. Not to be a nit-pickin' varmint or anything, but that's a Millers Falls #2, not a #5. Thanks for paying attention to details! Corrected. That was one Herculean effort in the form of a blog post. Great info for anyone interested in handtools. Just curious, it was there, now it's not. I hate to pick holes at you, but I must. When you discuss blade metallurgy 1095 and HSS towards the end of your post. You classify 1095 as a low carbon steel unsuitable for edged tools. I hate to be blatant, but this is flat out wrong. 1018 or A36(common hot rolled bar stock from the home center) is low carbon steel. The designation of 10XX means it's simple plain steel the two digit number after that denotes the percentage carbon. 1095 is iron with .95% carbon added. This is in fact more carbon that can be contained in the as-quenched hardened steel. That peak limit is .84 carbon (or 1084). The spring in the steel is due to the tempering cycle the fully quenched steel has been put through. This cycle takes really hard (and brittle) steel and takes the stress out making it slightly softer, but flexible, giving it the springy ability. And 18th century and early 19th century plane blades, chisels and other hardened tools would get the ASMT classification as 1095. 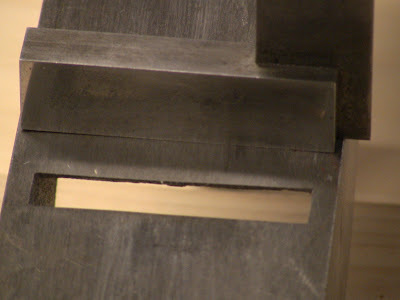 And because of the methods of their manufacture could have extremely hard edges, backed by a softer iron, this would absorb shock from the steel and keep the brittle steel from fracturing. It seems a little strange to me that for an article so technical about other steels you would make such a major mistake with 1095. No slight intended, maybe it just seems weird to me because I've read a lot about 1095 and W1 and aren't nearly as interested in A1 and O1 like todays manufacturers of edge tools. If this sounded like an attack forgive me I mean nothing from it, just wanted to put my research to use. I think O1 and A1 can be intimidating for someone thinking about making some tools, they are much more difficult to harden than 1095 and thus more risk of screwing up. I wanted to make sure people know about the easy to use tool steel, and were getting the facts. In response, first I'd like to say thank you for pointing that out! Metallurgy is a new area for me, so in going through books and web pages and trying to digest it all, I'm not surprised I got something confused, since I was more focused on distinquishing W1 vs. O1 and A2. I knew that 1095 was used for saw plates, but I didn't know it was used for plane irons. Doing some quick re-digging around now, George Wilson on Sawmill Creek says 1095 is the same as W1. And in "Steel metallurgy for the non-metallurgist" by John D. Verhoeven, on pg. 99 in Google Books, he says they are essentially the same composition. I also see some references to using 1095 for knifemaking. So I'll correct this to reflect that. Cool I'm glad I could help some. Perhaps the post was rejected by blogger for being so long, thought I was spamming? Metals are crazy complicated, I took out the ASMT/SAE metals reference book one time (500 pages or something) I was so overwhelmed I just read the simple high carbon steel section. More info than anyone could possibly think about on steel there. Wow Steve, just wow! You have my admiration for your ability to carry on an intelligent thought through such a long post. This is an excellent place to start for defecting power tool junkies! thank you for making me realize I actually have half a dozen German wooden jack planes on my shelves! Somehow I was convinced that wooden jacks would be longer, like the Miller Falls on top of the picture. How do you tighten your saw vice? I am currently making one, but I like yours because it looks much more simple, but I can't figure it out. You can't really see it in the picture, but the long clamping jaws of the vise wedge into angled slots in the uprights. The jaws have matching angled slots chiseled into them. You hammer them in for a friction fit. I adapted this design from some photos I found online, though I don't recall where. I have had to put a C-clamp in the middle to tighten it up a couple times. However, now I prefer the Lie-Nielsen style vise from this post: http://www.closegrain.com/2011/06/building-lie-nielsen-saw-vise.html. 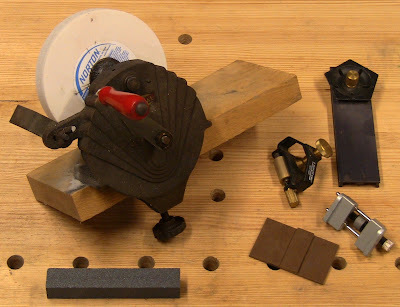 Do you use the Lie Nielsen style to to sharpen your full size saws? That was what I was making this vise for. Yes, I made it 18" long by 8" deep to accommodate my largest rip saw. The depth is the main thing. You slide the saw along to the next section when you complete a part. And of course it can handle anything smaller, all the way down to my smallest dovetail saw.